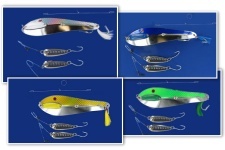 Spreader Bars, Squid Bars, Squid Spreader Bars & Rigging for Trolling - TGT Tackle :: Tournament Grade Tackle co.
For those who like to troll smaller lures to match the hatch, the TGT Spoon Spreader Bars fills the bill. Nearly indestructible to the toothiest of fish. These bars come fully rigged with a 24" spring Stainless Steel Spreader Bar, one of Herring Spoons in any of our four colors on the center drop, and two winglet spoons. Can also be used with one of our larger bunker spoons. Saves money by not having to replace shad like those on typical umbrella rigs.